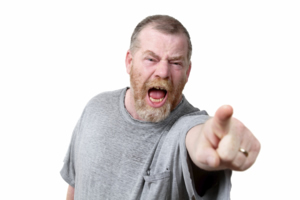 Do you find yourself reacting angrily or irritably snapping at the smallest thing? Have you shouted, argued, hit out, thrown things or attacked someone at the slightest provocation? If so, it could be that you have an anger management issue. Anger is a normal process and it isn't a bad thing in itself, but problems can occur if it isn't managed in the right way. If you have an anger management issue that you would like help with, then contact any one of the organisations and services listed by The Community Programme for information, practical advice, support and help with addressing this problem. This includes help with understanding the situations that make you angry, recognising why you get angry and strategies to help you to manage and positively channel this anger. The Community Programme can also put you in touch with support groups in your area, where you can speak with others similarly affected about your anger and negative emotions and learn from the experiences of others. Similarly, you can discuss your concerns on our free, confidential online forum. If you need practical help and support or specialist advice with this issue, please act now and contact one of the organisations listed by The Community Programme.